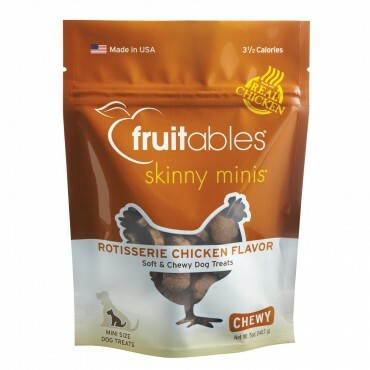 Fruitables Skinny Minis Rotisserie Chicken Flavor dog treats have the taste and aroma of a slow roasted chicken with its caramelized juices. These Skinny Minis combine the same great taste and aroma in a CalorieSmart pumpkin recipe that makes for a healthy option for everyday treating. Pumpkin, Oatmeal, Ground Brown Rice, Tapioca Starch, Vegetable Glycerin, Chicken, Ground Potatoes, Brown Sugar, Canola Oil, Ground Oats, Gelatin, Salt, Natural Rotisserie Chicken Flavor, Phosphoric Acid, Sorbic Acid (a Preservative), Mixed Tocopherols (a Preservative), Rosemary Extract.